Light, both natural and artificial, and the resulting shadows are the things that constantly inspire Kyee Myintt Saw’s imagination. Light is his true subject. He explores light in the context of his favorite scene: the market. He paints the market in the blaze of early morning, the fresh palette of tropical colours imparting the energy and bustle of the merchants as they start their day. In recent years, he has explored the nature of the market at night, an entirely different world with its secrets and shadows. 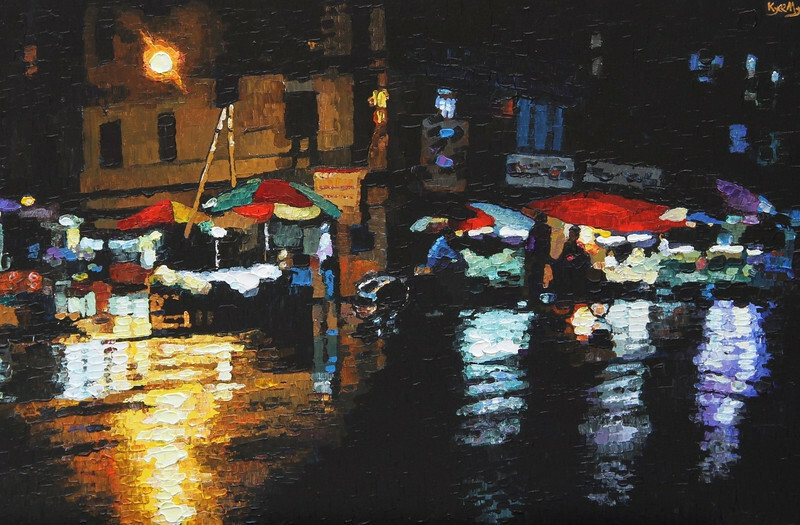 These are more somber, reflective works showing the market at night, sometimes after a rain when the puddles catch, fracture and reflect the different colored lights which illuminate the market stalls. While the bustle of the day is over, these night scene paintings still convey a calm exuberance, tempered by an awareness of individuals’ loneliness. In the night series, we can see Kyee Myintt Saw’s complete mastery of impasto work, created by his palette knife. The illuminated areas seem to shiver in the embrace of the multi-hued darkness.